In January we’re discussing Adam Curtis‘ 2016 film HyperNormalisation with Neil Lamont. Please view the film before the book club. HyperNormalisation (2016). Directed by Adam Curtis. BBC, documentary, 2h 46min, 16 Oct 2016 (UK). View on BBC iPlayer or Vimeo. 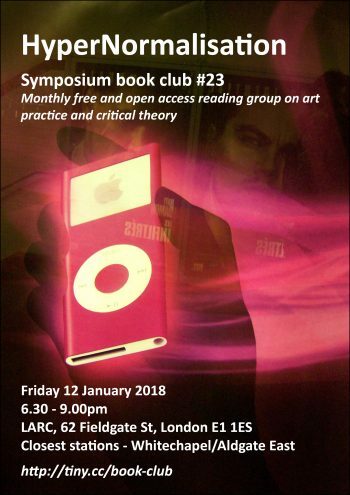 [SYMPOSIUM]#23 Adam Curtis: HyperNormalisation. Flyer by Neil Lamont. The documentary makes a wide-ranging analysis of systems of political, institutional, financial and psychological control. Curtis argues that a significant change began in the mid 70s and has advanced headlong ever since. Political and financial leaders retreated from an increasingly complex and morally ambiguous world and began to construct a new narrative that reduced the complexity to simpler (and false) stories capable of engendering a stable state reality that consolidated their power and made protest powerless. These leaders began to manufacture our perceptions of reality through interlinked networks of propaganda and PR, the media, powerful financial interests, control of cyberspace, the creation of desire, manipulation of fear/anger, and surveillance. The net result, he argues, is a fundamental de-linking between the world as it really is and how we understand it. So that, as a culture – maybe as a global culture, maybe as a species – we have become lost in a fake world, a manufactured reality. I strongly recommend you don’t read anything about it before viewing! – allow yourself to follow (and critique) your own response – thoughts, analysis and feelings. You can view the film online on BBC iPlayer or Vimeo. Note that the final chapter (from 2h 00m) covers the last 7 years – Occupy, the Arab spring, Putin’s methods, Syria, and Trump’s presidential campaign. Finally, we’ll also watch a short extract at the start of the session (max 10 minutes). Neil Lamont is a practising artist who works – among other things – with the themes of modernism, utopia and dystopia. Neil studied history in Bristol back in the 1970s and in the last few years has spent time studying and discussing modern philosophy. a) what’s going on here? – what techniques does hyperNormalisation use?, where does it borrow from artistically?, how is it structured? b) genre: is it an artwork or a political/philosophical argument?, or both or neither? c) what is its political philosophy? and what political or philosophical arguments or traditions does it draw on? d) does it hold water as a coherent, valid or correct argument? e) what’s the difference between an explanation/perspective, a grand narrative (e.g. religions, the Enlightenment) and a conspiracy theory? f) why do conspiracy theories seem to offer such a strong psychological/social appeal to some groups, and especially so in the 21st century? g) are we now living in a post-truth world? h) did we ever live in a truth world?